Concrete Secondary Containments are one of Superior Industrial Maintenance Company’s many specialties. We have successfully installed and repaired millions of square feet of secondary containments in our company’s history. When we look at existing containments we take several things into consideration prior to beginning the repair work. This post will dive deeper into the idea of a successful coatings system for the job. We have multiple staff members with NACE, SSPC, & ICRI certifications/affiliation with years of practical field experience. We also utilizes the best coatings manufacturers in the world that help us consult clients for meeting their needs & safely containing the cargos in question. Question #1: What are we trying to contain? Question #2: What are the safety issues involved with the area & the chemicals? Question #3: How long are you(owner) trying to contain your cargo in the event of a spill? Question #4: We like to discuss and look at structural issues if any are present under initial visual inspections and site visits. Question #6: We like to ask about cracks & expectations of crack repairs. We break cracks down in two categories: Active/Expansion joints or Non-Moving/Control Joints. We supply the owners with our details to address both moving & non-moving joints. Once the all of the questions have been answered we move to the coatings systems. 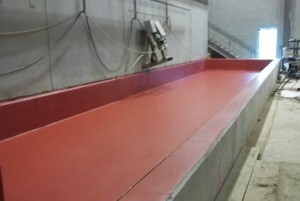 When it comes to concrete containments there and many systems that meet and exceed application needs and expectations. We have a long history with concrete restoration via polymer concrete, urethane cement, & MMA concrete. We also have successfully applied Epoxies, Epoxy Novalacs, Vinyl Esters, Poly-Urea, Polyurethane Elastomerics, Roll-Mat-Roll applications, Trowel-Mat-Trowel applications, & Geo-Textile Membranes with Polyurea & Polyurethane Elastomerics.